does she have white spot? if not, move her to a different tank & treat with eSHa 2000. i can't promise thet this will help! where are the red scales? does she look bloated? got anything hanging off her? are the scales sticking out? that is the ammonia reading? Hmm - sounds like an Ulcer and fungus... but there again I'm not great with thta sort of thing. Of course, we could do with isolating her - grab a breeding net and pop her in there - treatment could then continue nicely whilst she's not being bothered. Try a dose of melafix if it is an ulcer - if it's just the one scale red - chances are that's what it is. Oh bless. Ok - if you haven't got a breeding net, just use your normal fish catchingnet - pop a few stones in the bottom to weigh it down, scoop her gently into it, and rest it at the top of the tank, so the majority of it is underwater. That way, she has her own private space, the oxygen level will be higher as she's higher up, and you can see her more easily. 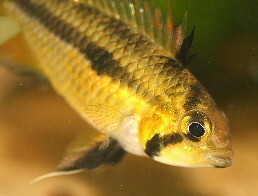 A breeding net is just like one of these, and clips to the side of the tank. can you get a pic of that red scale? wait till tomorrow for the whitespot treatment to be done before doing anything else. it would be best to move her to the other tank tomorrow, but ONLY if you can maintain the correct temp! that way you would only be treating her. If she is dying the other guppys will nip at her. If your other tank is small and you have a heating pad you can stick that on the outside of the tank to help heat it until you can get another heater for it. But I do hate to be blunt, It really doesn't sound like she will make it. She has been hurt and apparently is bleeding under the scale and maybe internally also. Unless you can get her seperated and start treatment immediately I really don't give her much hope.